Photo above - The SBA resource partner panel, at the LGBT Business Builder event, shared the programs and services offered by each partner organization. It was moderated by (L to R) Ruben Garcia, SBA District Director, San Diego, with panelists Rosa Rodarte, SBA Lead Economic Development Specialist, Rachel Fischer, PTAC Director, Elizabeth Arce, San Diego SBDC, Consultant, and Liz Lemesevski, SCORE Counselor. The U.S. Small Business Administration San Diego District Office in association with the National Gay & Lesbian Chamber of Commerce (NGLCC) conducted an LGBT Business Builder event on April 17 at the Council for Supplier Diversity, in San Diego, CA. The Greater San Diego Business Association also assisted in the planning of this event. The purpose of the LGBT Business Builder is to remove barriers and increase access to strategic growth opportunities for America’s LGBT business owners. Leverage SBA's extensive network of resources to grow their business. Open their business to lucrative procurement contracts and opportunities. Take advantage of emerging procurement opportunities now open in California as a result of AB1678. Work with companies interested in working with LGBTBEs. The program was well received and a free follow-up workshop will be presented on May 14th, from 9 a.m. to 11:30 a.m., at Point Loma Nazarene College - Mission Valley Campus, 4007 Camino del Rio South, #206, San Diego, CA 92108. For more information about "Got LGBTBE Certified?" visit: www.GrowMyBiz.org. 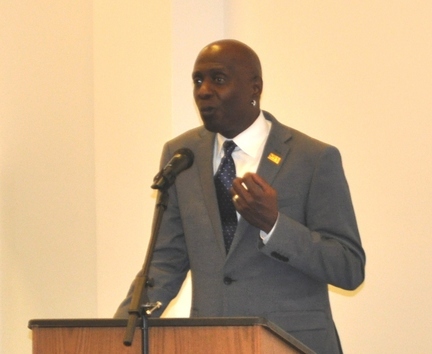 Above: Eugene Cornelius, Jr.,Deputy Associate Administrator for Field Operations for the SBA provided opening remarks at the LGBT Business Builder event held at the Council for Supplier Diversity offices in the Mira Mesa community of San Diego, California. Above L to R: SBA San Diego's Ruben Garcia, District Director, Michael Sovacool and Maria Hughes met with Brian Goodrow, Field Operations Specialist, SBA Office of Field Operations; Selah Mun, COO-CFO, RVL Reveille Group, LLC; Joe Stallings, PMP, Program Manager, SBA Boots to Business Program, XCORP Solutions and Bruce Purdy, Deputy Assistant Administrator, SBA Office of Women's Business Ownership, to discuss the future of the Boots to Business entrepreneurial training program in San Diego County. We are considering adding new military installations to our current programs, which are located at MCRD San Diego, 32nd Street Naval Station in San Diego and Camp Pendelton in Oceanside. 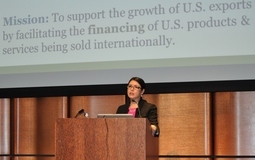 The SBA San Diego District Office conducted an export workshop, at the San Diego Public Library Downtown, for business owners who are thinking about exporting. SBA District Director Ruben Garcia provided opening remarks to our forty-five attendees. Cynthia Harris, SBA District International Trade Officer, coordinated and moderated this event. Left: Rosa Rodarte, SBA Lead Economic Development Specialist, and Martin Selander, Regional Manager, SBA's U. S. Export Assistance Center. Rosa Rodarte assisted with venue set-up and registration for this event. Martin Selander spoke about SBA's International Trade Financing programs. Right: Victor Castillo, Director of the San Diego Center for International Trade Development presented Exporting 101: Information and Resources to Get You Started. 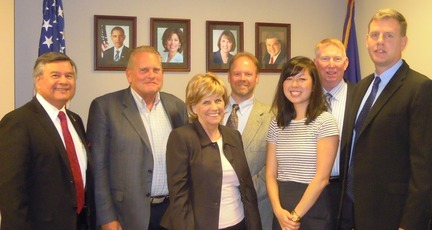 Left: Sandra Donzella, Regional Director of Export-Import Bank presented How Export-Import Bank Can Help You. 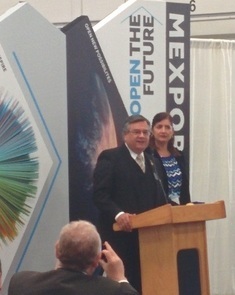 Ruben provided opening remarks at the MEXPORT Industrial Trade Show in Otay Mesa, CA. Cynthia Harris (not shown) worked an exhibit table, in conjunction with representatives from the San Diego Center for International Trade Development and SCORE. Keynotes by government officials on the forefront of implementing emerging technologies in their agencies. Industry subject matter experts and thought leaders introducing best practices in transforming public services through information technology. Certificates awarding up to 6 CPE’s accredited by The George Washington University Center for Excellence in Public Leadership. In depth discussion of government’s path forward to aligning new technologies to serve agency missions. A mix of technology and trends for IT directors and managers to use in preparing to implement emerging technologies. Left: Linda Allen, Regional Commissioner, Federal Acquisition Services, US General Services Administration, presented a keynote speech on Opening Doors to Innovation. The SBA San Diego District Office has received #112 8(a) contract offers for a total offer value of $387,314,856 from buying agencies as of April 29, 2015. SBA's fiscal year started on October 1, 2014 and will end September 30, 2015. We are well on our way to exceeding our fiscal year 2014 contract offers. The SBA San Diego District Office InnovateHER winner is Cindy James, who submitted her concept for a family friendly day spa called Our Family Spa. Our Family Spa's mission is to promote health, well-being and fun for the whole family, by offering spa services in a family-friendly environment, offering onsite childcare and spa services for special needs kids. Our Family Spa's application was submitted to SBA's Office of Women's Business Ownership for national competition. Click here to see a list of the Top 15 InnovateHER National Finalists. InnovateHER was a cross-cutting women's business challenge to unearth innovative products and services that help impact and empower the lives of women and families. The San Diego InnovateHER competition judges reviewed eight business plan applications on the challenge criteria for entrepreneurs to create a product or service that has a measurable impact on the lives of women and families (30%), has the potential for commercialization (40%), and fills a need in the marketplace (30%). Thank you to our InnovateHER host Susie Cawood at The Microsoft Store - Fashion Valley for her assistance in coordinating the local competition. Also, thank you to our SCORE counselor judges, Greg Bowcott, Stephen Eisold and John Bjeldanes, who reviewed eight business plan applications on a very short turnaround time, to select our winner. 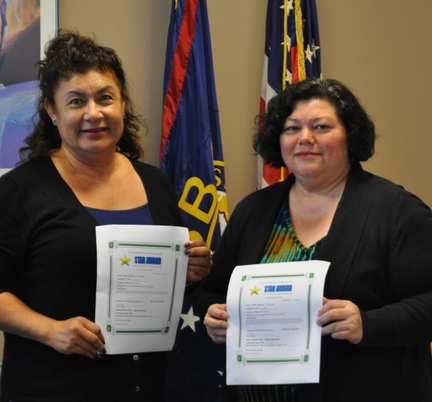 Above (L to R) - SBA San Diego's Rosa Rodarte, Lead Economic Development Specialist and Cynthia Harris, Economic Development Specialist received recognition, in the form of STAR Time-Off Awards, for going above and beyond their regular duties during SBA's fiscal year 2015 2nd quarter, which ended March 31, 2015.
organizations who have helped businesses succeed through guidance and advocacy. Date: May 6, 2015 - 11:30 a.m. - 1:30 p.m.
Barcelona Event Center, 330 Wake Avenue, in El Centro, CA. Individual seats will cost $35. To register contact the IV-SBDC at (760) 312-9800. Town & Country Resort and Conference Center, 500 Hotel Circle, North, San Diego, CA. How to do Business with the State / I Am Certified with the State Now What?